This week, I was heading to Dublin, with a serious hankering for some pulled pork. I don't know where it came from, particularly. I remember a friend talking a recipe a few months ago, and I suppose it just stuck around my head until now. It also seems to be popping up everywhere at the moment. 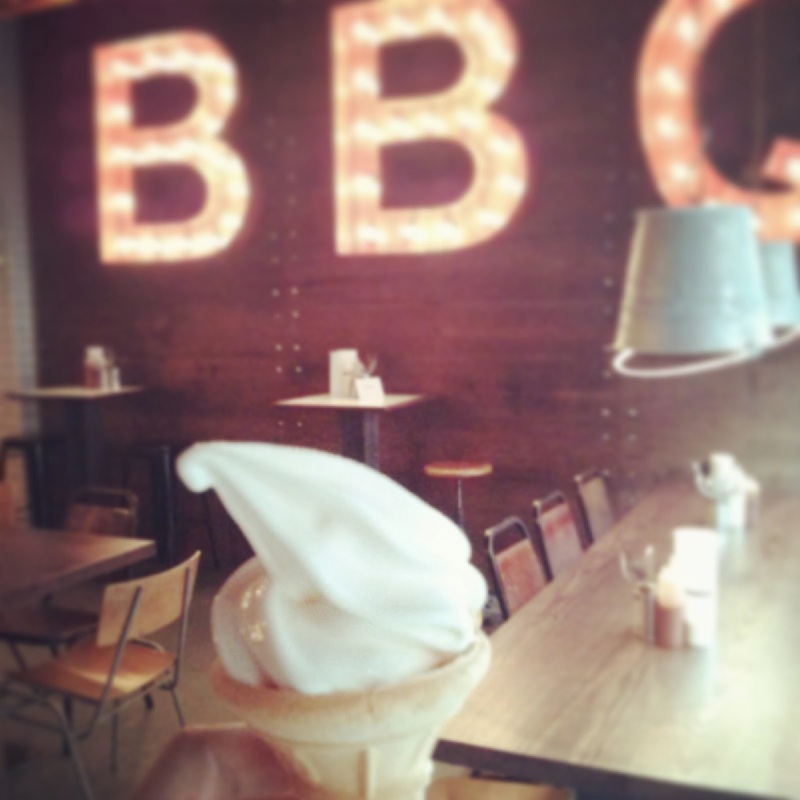 BBQ restaurants are the new... I don't know. The new Mexican restaurants? All of a sudden, people have a craving for some meat, Southern style. 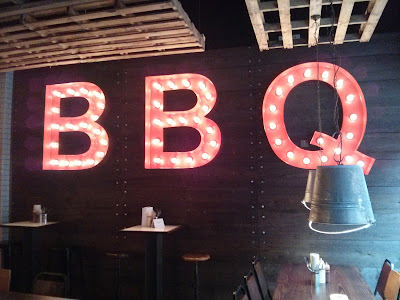 Incidentally, I told a friend about this BBQ place the following day. He thought I meant the garden style BBQ, with burnt sausages and chicken legs cooked to order. Interestingly, he is the one man I will never, ever suggest an actual BBQ to. He turns into this rage filled demon whenever he is put in charge of coals. And I will never forget the moment he attempted to flip a whole salmon that we were barbequeing, only for it to end up on the gravel. That was a good day. But all of this is besides the point. My hankering was so severe that I googled 'Pulled pork Dublin' on the train ride into town. There were a few places I spotted, but I happened upon my chosen destination completely by chance. And I'm jolly well glad I did. I was walking up the street, and the wooden exterior leapt out at me, as did the words Pulled Pork emblazoned on the side. It was fate, no? I headed in for what could either be a very cool late lunch, or a very nerdy early dinner. It was 5pm. And I hadn't eaten lunch, by the way. The cool (and very good looking) guys behind the bar pointed the menu my way. 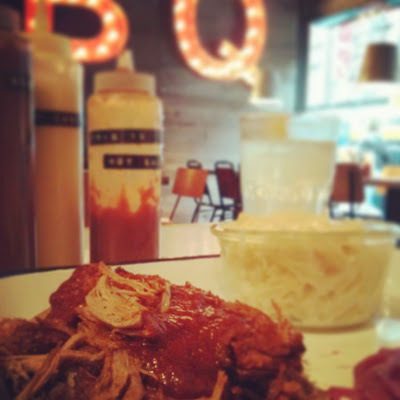 I plumped (plump being the operative word) for pulled pork, obviously, with my two sides being mac n cheese and fries. You remember last week, when I said that deep frying macaroni cheese was as perhaps as decadent as life could get? Well, I've changed my mind. Serving macaroni cheese as a SIDE DISH next to a mountain of pork and fries takes things to a whole other level. 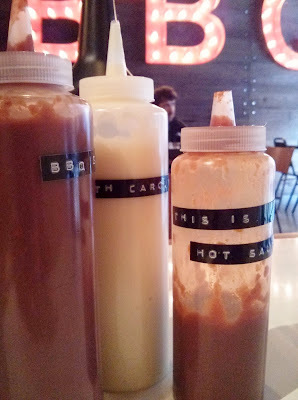 The sauces on the table were almost unnecessary, as my pork had a hefty whack of sauce itself, but I tried out the South Carolina, which was a mayo-based cooling dip. I didn't dare try the one labelled HOT, because the one I had was already burning my sensitive tongue. The mac n cheese was oozy and goozy and gorgeous, and worked surprisingly well with the tang and sweetness of the pork. The fries were hand cut, skin on, but a little undercooked for my liking. I've found this can happen earlier in the evening - the kitchen seem keen to get on and serve, so they take them out a few minutes too soon. I regret not getting the bone marrow mash, but I'll give that a bash the next time. The prices are really good - the Meat option from the menu (one meat, two sides) is €12.95, or you can get a bun meal with one side for €9.45 - €11.50. They do platters of wings, too, which I bet are pretty damn sweet. It would be a good choice for a rowdy group of carnivores. This is the place to take friends who are all about the meat. Don't go with people you're afraid of getting dirty around. You'll have sauce dribbling down your chin, bone marrow on your shirt and a dangerous gleam in your eyes. If you've ever ordered a salad as a main course, it's not the place for you. Another real bonus is that the staff are genuinely nice, and friendly (as well as being ridiculously good looking). They're chatty in a way that implies they are genuinely nice, rather than being forced into it contractually. Which is nice. Also? YOU GET TO MAKE YOUR OWN 99 WHEN YOU LEAVE. Seriously. You get a free 99 cone, that you pull yourself. This gave me such a giddy thrill. And it was exactly what I wanted, though I would have never thought of it myself. So I skipped along the street, 99 in hand (which sizzled whenever it hit my tongue) with the kind of chubby joy you only get when you properly satisfy a craving. Open from 12noon each day - no reservations. *Footnote: You really don't win friends with salad.